I hear voices all day long. In my car, when I’m cooking, even as I’m drifting off to sleep. No, I’m not crazy. But I am a little obsessed. Last year I wrote a post titled 10 Podcasts For The Christian Whose Faith Is In Transition and found that many people, like me, love podcasts and are looking for the best ones to add to their playlists. Podcasts have a way of connecting people and delivering ideas that is truly effective. In this article, I want to share with you a group of podcasts that have powerfully impacted me. 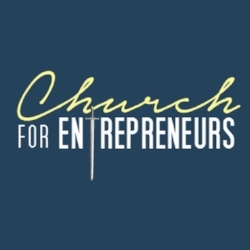 And if you are a Christian Entrepreneur – I think they’ll have something valuable to add to your journey as well. To begin with, I had to recommend the one I’ve been listening to the longest: Dale Partridge’s Startup Camp. If you’re not familiar with Dale, he’s the man formerly behind Sevenly and currently behind Unlearn Church. This podcast is easily the most professionally produced one in my queue. The guests are titans in their industries, and the takeaways are bountiful. I suggest listening to this one with a notebook and pen because you’re definitely going to want to capture his insights. I stumbled upon Mia Davies within the last 12 months and am so thankful I did. Her episodes are vulnerable, convicting, inspiring – and all within a sub-30-minute format. I love how personal this podcast is as well. Since I’ve been listening, I don’t believe she has had any guests on. Instead, she offers you a look into her own faith and business, and the challenges associated with each. Mike Kim is easily the most likeable “marketer” I have ever listened to (and one day hope to meet!). His podcast focuses primarily upon the subjects of goal-setting, personal brand building, and business strategy. His background both in the church-world and in the copywriting-world give him a perspective that you’d be hard-pressed to find anywhere else – and I mean that. Listening to Mike is like getting an encouraging letter from a friend, even if the letter was actually a 20-minute intensive on the psychology of influence. Don’t pass this one up. There are many people we can learn from online, but there are only a precious few we can honestly look up to. Jenna Kutcher is one of those few. She has a vulnerability about her that brings you in, disarms you, and almost makes you forget that you are listening to a brilliant 7-figure business owner. While the episodes themselves do not cover “Christian” topics, her ability to simplify business complexities and pull out some of the best interviews I have ever heard makes this podcast well worth the investment of your time. If you are in business for yourself, especially a digital-based one, you are going to have to write. It’s just that simple. And for many of us, that writing is going to look like a book at some point (or we would love to have one and understand the extreme leverage a book can provide). My friend, Thien Doan, has constructed a truly excellent podcast on the subject. As a pastor, church-planter, and fellow author – he can identify with the struggles in the field, while also encouraging us listeners through his successes. His guests cover the gamut, from mega-church traditionally published authors to up-and-coming self-pub advocates. If you have a book inside of you, give this one a listen. I’ve been listening to Dr. Amos for less than a month but the man has made me a fan for life. There’s an uncomfortable dichotomy in today’s church environment. Either we don’t talk about money (unless its about how we don’t have any and are praying for God to provide), or we make it the center of everything (and distort the role of stewardship). Dr. Amos bridges the two camps with a rare and refreshing maturity. His episodes are Biblically-rich, encouraging, and honestly not what you are going to hear in most churches. His messages are governed by the themes of stewardship, freedom, and God-ward focus. To finish off this list, I wanted to share with you one that has become like my daily spiritual multivitamin. I’ve had mixed experiences with short-form (under 10 minutes), daily podcasts in the past. I feel like they start off strong, and slowly become more of a chore than a joy to listen to. Somehow, Carey Green has found a way to overcome this and has been delivering consistent value for some time now. His voice is clear, his message is direct, and his encouragement is effective. If you have a morning routine (or are working on starting one), try sliding this into the mix and I believe you’ll be happy you did. That’s my list! I’d love to know your thoughts in the comments below: which one of these is the first one you plan to check out? And if you’re listening to a podcast you think Christian Entrepreneurs would love, write about it in the comments so I can check it out. I hope this was helpful for you and I pray that God may lead you on the unique path he has for you as he blesses the work of your hands.